He is joined by First Vice President Mary Ann Borgeson, Douglas County, Neb. commissioner; Second Vice President Gary Moore, Boone County, Ky. judge/executive, and Immediate Past President Roy Charles Brooks, Tarrant County, Texas commissioner. In the only contested race, Moore bested three opponents, winning in the third and final round by a margin of 31 votes out of 2,561 cast. Cox’s presidential initiative, “Connecting the Unconnected,” will build on former President Roy Charles Brooks’ “Serving the Underserved” campaign. His effort will focus on using technology, data and public-private partnerships to connect people to services. “This initiative will explore the many ways counties link residents to services. It builds on NACo’s previous effort led by the Honorable Roy Charles Brooks, in Serving the Underserved, by continuing to inform and illustrate how counties help our most vulnerable citizens forge pathways to live well and thrive. 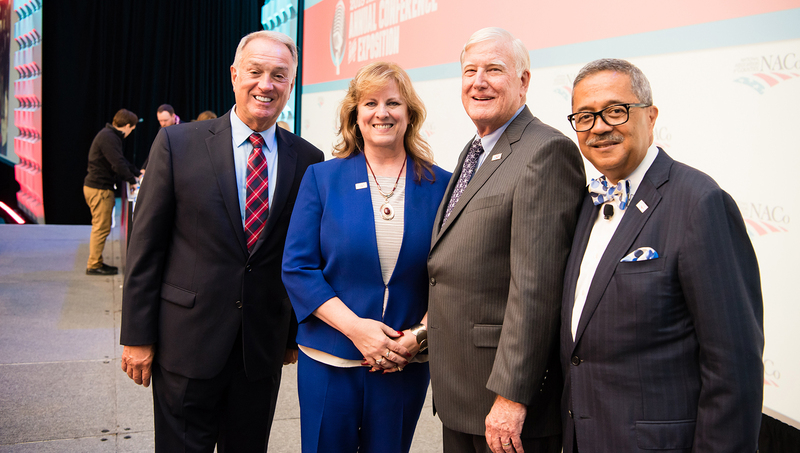 “Over the course of the next year, NACo will demonstrate how counties deliver “people-centered” services, maximize government efficiency and ensure responsible stewardship of taxpayer dollars,” he said. The six-term San Diego County supervisor began his public service on the Chula Vista City, Calif. Council, where he also served as mayor before running for county supervisor. At the Business Meeting, NACo members also adopted just over 100 new policy resolutions as well as 20 changes to the County Platform, the association’s formal compilation of policy positions. In other NACo business, the Board of Directors approved a new member program — the NACo High Performance Leadership Academy — that will provide an integrated, online 12-week development program in high-level skill development for county staff subsidized by NACo. The Davidson County/Nashville-based conference attracted record numbers, over 3,000 registered to attend. Participants were offered a full agenda, starting with the traditional pre-conference County CIO and Technology Leadership Forum, co-sponsored by PTI, and the Smarter Counties Summit, July 12–13. Both the CIO Forum and the Summit took looks at cybersecurity and the U.S. election infrastructure. Brian Newby, executive director, U.S. Election Assistance Commission, keynoted an afternoon Summit session. The conference also set the stage for celebrating the 50th anniversary of County News, marked by a special drink at the Opening Reception, the Byline Blast; video congratulations from NACo members; and an interactive County News kiosk, where attendees could search newly-uploaded digitized archives of NACo’s official publication of record. General sessions featured an inspirational talk from former NFL star running back Eddie George about coming to terms with the end of his football career, an equally inspirational address from children’s rights advocate and rock star, Marian Wright Edelman and an entertaining panel discussion from three Nashville singer/song writers who had composed hits for some of the town’s most well-known County/Western stars. Attendees took full advantage of two series of presentations which mixed corporate solutions to county problems in one-on presentations, “County Talks,” mimicking the popular Ted Talk format, and panel discussions with county customers, dubbed “Solution Spotlights.” Participants could also attend specialized, two- to four-hour training sessions on topics such as crisis communications challenges or technology leadership. A special forum on affordable housing brought together stakeholders and counties to discuss cutting-edge solutions to bring more affordable housing to communities. Volunteers at the traditional NextGen Community Service Project filled 200 backpacks with supplies for homeless youth served by the Oasis Center, a human services non-profit agency in Davidson County. Award presentations are standard events at every NACo Annual Conference. Award winners are feted at the annual Awards Luncheon, which spotlights the 20 Best of Category Achievement Award winners. The NACo Achievement Awards program, now in its 48th year recognizes innovative concepts that improve county governments. The Americans for the Arts presented the Public Leadership in the Arts Award to Hillsborough County, Fla. and NACo’s Arts and Culture Commission honored the Davidson County, Tenn. Juvenile Court with its Local Arts Advocacy Award. The NACo Presidential Scholarship awards went to Michael Matthews, Jr. and Mercedez Saldana from Tarrant County, Texas. The Davenport Financial Group and the Linebarger Attorneys at Law sponsor the scholarships, which are awarded annually to college-bound students in the home county of the outgoing NACo president.